This is how it all began. 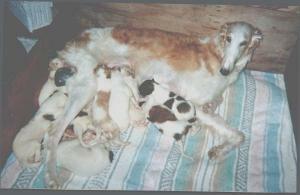 Stoli had a litter of Valentine's Day pups, sired by Alejandro, February 14, 1999. Included in this picture are babies Amadeo, Xena, Chui, and Demetri. 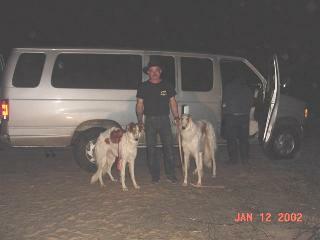 Amadeo spent a few months at the end of 2000 with his friend and handler MVZ Guillermo Cavazos de las Fuentes of Mexico. They have been showing in Mexico, Costa Rica and Cuba. 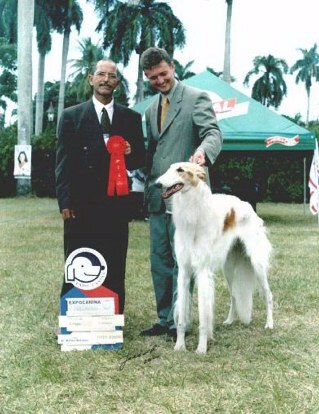 He is picture below winning Hound Group Second in Cuba. Amadeo April 2000 at home. 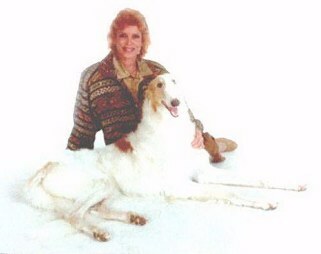 Amadeo's first USA show weekend was a great success winning his first Winners Dog and Best of Winners for two points under the Judge Dorothy Nickles on April 7, 2001. Sunday was "almost" as good. Amadeo won Winners Dog, losing Best of Winners to his beautiful sister, Xena. 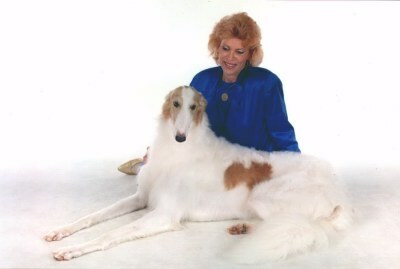 Older sister, Mariska, won Best of Breed both days and a Hound Group Second. The shows were held at Crosby, Texas on April 7 and 8, 2001. 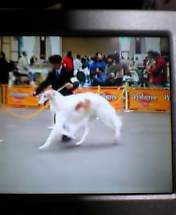 Amadeo is shown in the bred by exhibitor class. 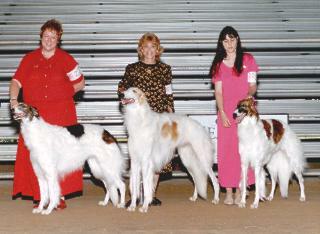 (L to R) sister Mariska (BOB/Gr.2), brother Amadeo (WD), sister Xena (WB/BOW). Mariachi is pictured with Amadeo leaving for California prior to going to Japan. They are off on a big and exciting adventure. 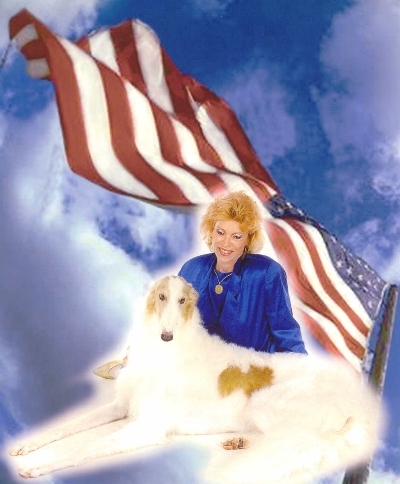 Amadeo finished his American Championship with his third major, in California, Saturday, January 26, 2002, under Judge Susan Dillon. He is Shefaro's first champion of 2002. Sister Xena won her second major Sunday, January 27, 2002, in Ohio and now needs two minor points to finish her American Championship. 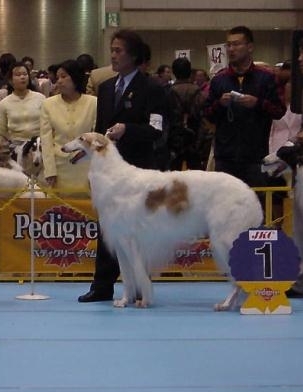 Amadeo went to his first show in Japan and won second of 23 males in the show. He was 2nd of 13 champions and received an AWARD OF MERIT. It was his first show in two years and he was tentative about the flooring at the showgrounds. He will be first next time. He is pictured with his handler, Mr. Tatsumo Mera. 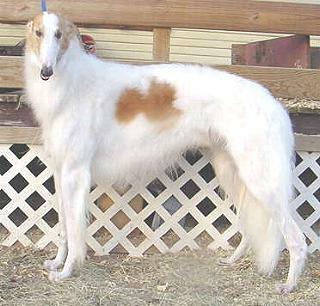 Breeds to which the Specialty System is applied. WD 2719 ZABAVA METEOR / 7,11 2002. Mariza forever glacial - Zabava winter berry jc. 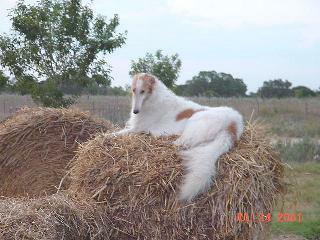 (Am,ch) Ksar po dusham aruba - (Am,ch) Po dusham song of the south cd. 2722 SHAMAN OAKS JP DIAMOND DUST / 1,20,2002. 2723 PINELET JP GOLDCASTLE VINCENT /2,22,2002. 2734 SPARKLING STAR JP KAISER / 7,10,2000. 2735 SPARKLING STAR JP WIND / 4,26,2000. 2736 BRYAN OF TOKAI MARUMURA JP / 12,25,1999. 2727 PINELET JP ZEPHYR THE BLACK ART /6,8,2003. 2728 YUI DREAM JP'S OLIVER / 7,1,2001. 2730 Ch/2,04 SUNBURST HESTON AT MOONSTAR JP/1,1,2003. (Am,ch) Chataquas valimir of kyrov sc -(Am,ch) Sunburst amazingrace troybhiko. 2731 Ch/2,04 DOG COMPANY JP APOLLON /6,4,2002. 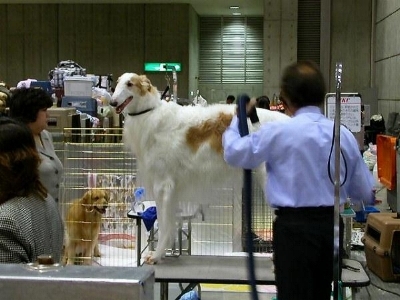 (Japanese Kennel Club,ch) Balmer of pet salon lovely jp -Pinelet jp nicole grace. 2732 Ch/6,03 PINELET JP WILD GOLD EYE / 6,4.2002. 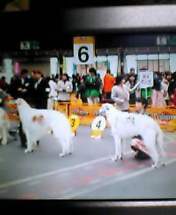 (JKC,Int.ch,ch) Islaev of egami garden fci -(JKC,ch)Pinelet jp goldcastle tiffany. 2733 Ch/2,04 BELISARIUS JP KILIMANJARO/4,28,2001. (Am,ch) Majenkir magnificus - Morganval coqetteat majenkir. 1BOB 2734 Ch/2,04 KENAI'S LAST OF THE DOGMEN / 1,11.2001. (Am,ch)Kenai's keys to imagination - (Am,ch) Timber ridge's abiof kenai. 2735 Ch/1,03 SPARKLING STAR JP KUCKY / 7,2,2000. (Am,ch) Andvell's zack attack - (JKC,ch) Sparkling star jp marls. 2736 Ch/10,02 RAIDERA OF SWORD PLEASANT JP / 6,19,2000. (JKC,ch) Altair of senshu yagami jp - (JKC,ch) Nadia of senshu yagami jp. 2737 Ch/6,02 BRITZ OF ABEL HOUSE JP /2,25,2000. 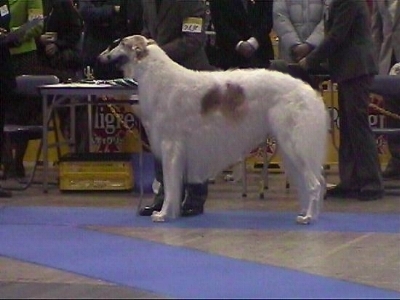 (JKC,ch) Khanazar of egami garden fci - Oak apple sweet malera fci. 2738 Ch/8,01 BELISARIUS JP C-E WHITE SHADOW / 4,8,1999. 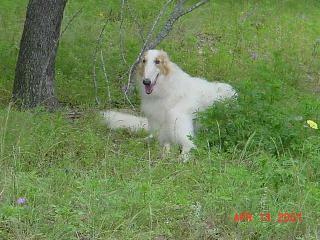 (JKC,Int,ch,ch&Am,ch) Secretgarden song of song - (JKC,ch) Belisarius jp ines sweet treat. 2739 Am,Mex,Crc.G,Cub.G Ch / SHEFARO ALEJANDRO'S AMADEO /2,14,1999.owner:Yoko Nozaki. 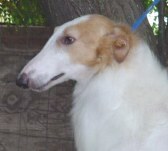 (Am ch) Shefaro reyna alejandro fnx - Zari's stolishnaya aristar. 2740 Ch/7,01 MOON STAR JP'S GROOVY / 1,1,1998. (JKC,ch) Moon star jp's willy - (Am,ch) Rising star's lori. 3 2741 JKC,Am,ch/ SECRET GARDEN GRAPES OF WRATH / 11,23,1997. 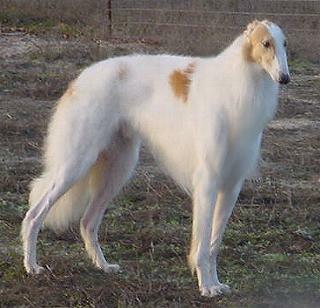 (Am,ch Sg sword of the spirit - (Am,ch) Secret garden russia. 2742 JKC,Am,Can,ch/ ABIDAN'S MOETCHANDON / 4,27,1996. 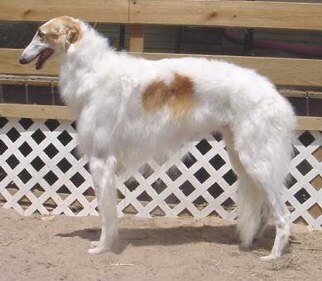 (Am,ch) Majenkir timotheus seven - (Am,ch) Steppeland katrina of abidjan. 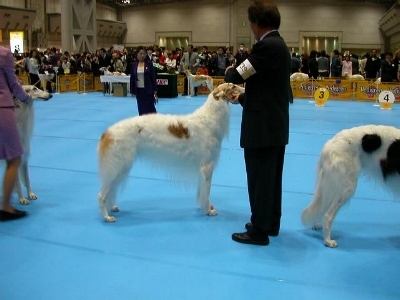 2005 FCI International dog Show in Kanagawa.